Learn How To be a Better You! Use Subconscious Mind Power and The Law of Attraction to discover The Ideal You and create The Life of Your Dreams! What's the one thing you'd change about your life? Aside from the past, because that's written, unchangeable. What would you change today? Is it money? Is it happiness? Is it success? Is it love? What if you learn how you can easily change it? Discover How to Be a Better You! Your Blueprint, Life by Design Reveals exactly how to use your Subconscious Mind Power and The Law of Attraction to Discover The Ideal You and create The Life of Your Dreams! As you know, Your life is colored by your past. But is your future set in the stone of your history? Regardless of your past, your shortcomings, and the condition of your life; you have the power to choose a different path. You have the power to change, to Be a Better You. Discover how to Unlock your true potential And Live the Life of Your Dreams! Your Blueprint, Life by Design is The Transformational Guidebook that empowers you to live a powerful life! Read Your Blueprint, Life by Design and discover a complete system full of proven methods to use your Subconscious Mind Power and The Law of Attraction to create success! Live a life of Abundance! Free Yourself From Past Mistakes. Discover Your Purpose in life! Discover how you can experience the Life of Your Dreams! Unleash the power of your Subconscious Mind! Your Blueprint, Life by Design will help you! How and Why Your Subconscious Mind Controls up to 90% of Your Life. Why you must Believe in Yourself to succeed. How to Break Old Patterns that sabotage your success! How to Change Your Subconscious Beliefs. How to Effectively use the power of The Law of Attraction! How to Change Your Bluepint, Harness its Power, and Create True and Lasting Change in your Life! How to be the Best You Possible! Reveals Methods Proven to create lasting change. Click the Buy Now button and Order Signed Copies! 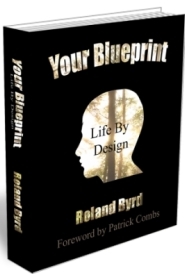 Get Your Blueprint, Life by Design Today! Your Blueprint, Life by Design came from the question, "What if I could use the Law of Attraction to be the ideal me?" As I explored this, I discovered the power of the Subconscious Mind and realized that was the Key to effectively harnessing the power of the Law of Attraction. Up to 90% of our thoughts are Subconscious. I'm sure you've heard the phrase, "What you think about, you bring about." The Law of Attraction gives you what you think about. It doesn't matter if 10% of your conscious thoughts are about money or success or fitness or happiness if your Subconscious Thoughts, the prevailing 90%, are about lack, failure, being unhealthy, or are filled with sadness! But once you change your Subconscious Thoughts to match your Conscious Desires... That's when you Tap the Awsome Power of the Law of Attraction! That's when you're on the way to the life of your dreams! Your Blueprint, Life by Design gives clear, easy to follow directions that show you how to change any part of your life. It helps you discover your true purpose, gain clarity about who you really want to be, and guides you on your personal path of discovery and change. Your Blueprint, Life by Design, is the definitive success guidebook about using the Law of Attraction and your Subconscious Mind to create the life you desire. Best of all, as you Read Your Blueprint, Life by Design, you feel like you and I are having a relaxed conversation. We're two friends, sitting comfortably, discussing knowledge and my easy to follow system. A system that's changed my life and helped so many others redesign theirs. If you're serious about learning to use your Subconscious Mind Power and The Law of Attraction to change your life, to be your Ideal You, and to create happiness and success, then buy your copy of Your Blueprint, Life by Design today! And when you Buy your Copy of Your Blueprint, Life by Design from my website I'll personally sign it! Remember, there's no time like Now to take control of your life. Take back your life! You have the power within to Be a Better You. You have the power within to Create the Life of Your Dreams. You have the power to Be The Miracle and create lasting change in your life and the lives of those you care about. Your Subconscious Mind holds this Power, it's the key to your success! Read Your Blueprint, Life by Design and discover the Keys to Unlock the Ideal You! "Your Blueprint offers a fresh, unique perspective about your Subconscious Beliefs, the Law of Attraction, Personal Accountability, and how they intermingle to create your life." - Joe Vitale, as seen in the smash hit movie, "The Secret." "What a wonderful thing you have done to help others have the tools to change their lives for good! ...I really enjoy your style. It's like I'm talking with you." "Mr. Byrd, with this his first book, has shot up a flare indicating that he has the chops to become widely known as the next great self-help author." This book has an extremely insightful approach to life no matter what your current status is. The author is speaking from his own astonishing experience and life trials. This means so much more to me than someone who has not been through the tough times like most of us have. I highly recommend this book.Well worth the investment!!! I'd like to help you improve all areas of your life. Sign up for The Blueprint News and Recieve weekly Tips and Motivational Messages guaranteed to help you unlock your true potential and to Be a Better You! You'll also get my free 12 page report, Releasing The Muse, which reveals how to Unlock Your Creative Intelligence! And my free bodyweight workout guide and exercise list! Imagine what you'll accomplish as you unlock your Creative Intelligence and learn to Be a Better You! Reproduction of any portion of this page is strictly prohibited without the express written consent of YourNewBlueprint.com.